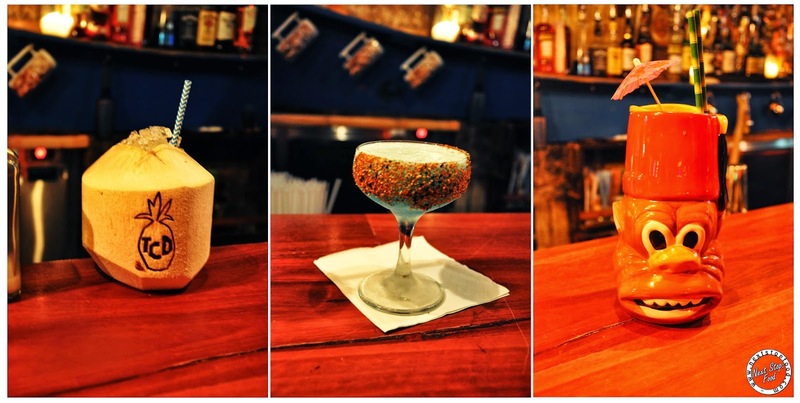 Next Stop: Food | Food Blogger located in Sydney Australia: Yurippi At The Cliff Dive - Head Here For A Good Night Out! Yurippi At The Cliff Dive - Head Here For A Good Night Out! With the address indicating "Oxford Square", I thought it was located inside the Oxford Square where Fitness First is. After asking around, we found the bar with its bright pineapple door near Burton St - at the other side of the road! Don't make the same silly mistake as us.. I curiously stared at the glowing thing as I walked down the stairs - HELLO GLOWING TIKI MASK! Following the trail, we were then greeted by a huge tiki statue. We were informed by Sam who is a bartender at The Cliff Dive, that the owners (Alex Dowd, Jeremy Blackmore and Russell Martin) imported these from Bali, in a shipping container along with the other furniture and decorations in the bar. What a way to set the mood! The cocktail list was created by Michael Chiem (ex Sokyo and Black) to incorporate the Tiki theme. 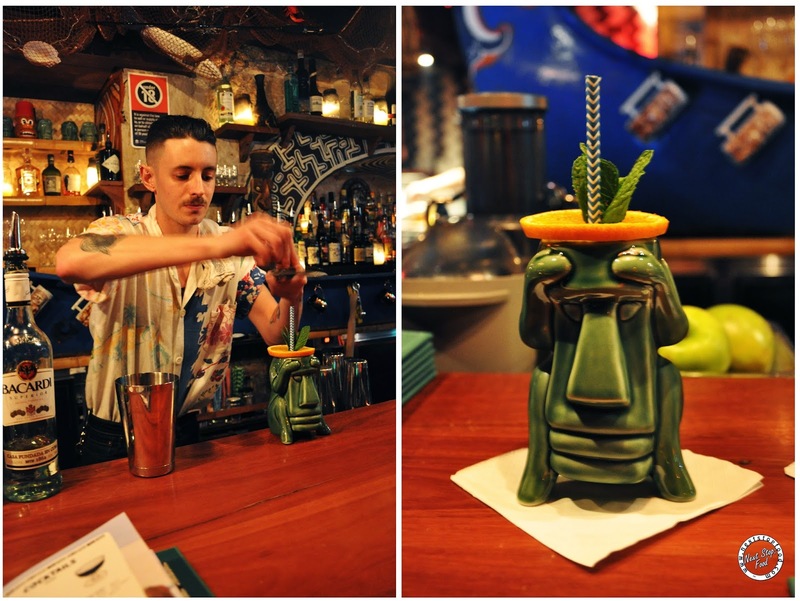 The Zombie is a tradition Tiki drink and as its name suggests, it's packed with plenty of alcohol! The first sip is a strong alcohol taste, but afterwards the citrus takes over and becomes smoother to drink. As a bonus it also comes in a cute mug!! Coconut and lime might seem like an odd combination, but it taste very refreshing! They make their own macadamia orgeat (which is sugar syrup made from nuts) to ensure the unique flavour. Togarashi is a Japanese mix of spices and be warned, it is quite spicy but the lime in the drink complements well with the spiciness which makes this drink rather special. Look at this mug! Sam prepared the Monkey Hat cocktail just for photo purposes (shouldn't drink so much on a weekday). He said it's one of their most popular cocktails. Yurippi is new and created by The Cliff Dive, so people can enjoy food with their drinks. The menu is created by Honky who was also free to explain the dishes for us. 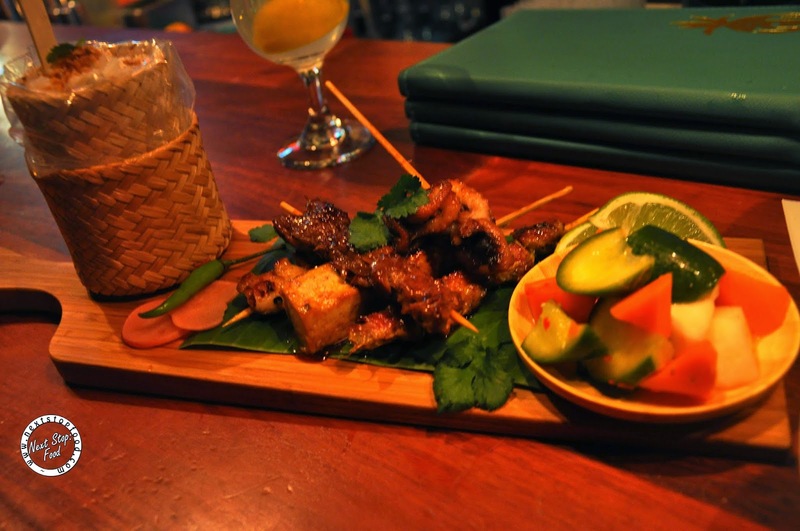 All the skewers have different Asian marinades, these being Beef with wild ginger, Pork with turmeric and lemongrass, Chicken with lemongrass + satay sauce; Octopus with chilli & ginger and Tofu with chilli & tamarind. All of them were tender and the flavours were AMAZING. My favourite one was the octopus. The picked vegetables helped to balance the spiciness from the skewers. Pandan rice was so good that I could have a whole bowl for dinner every day! 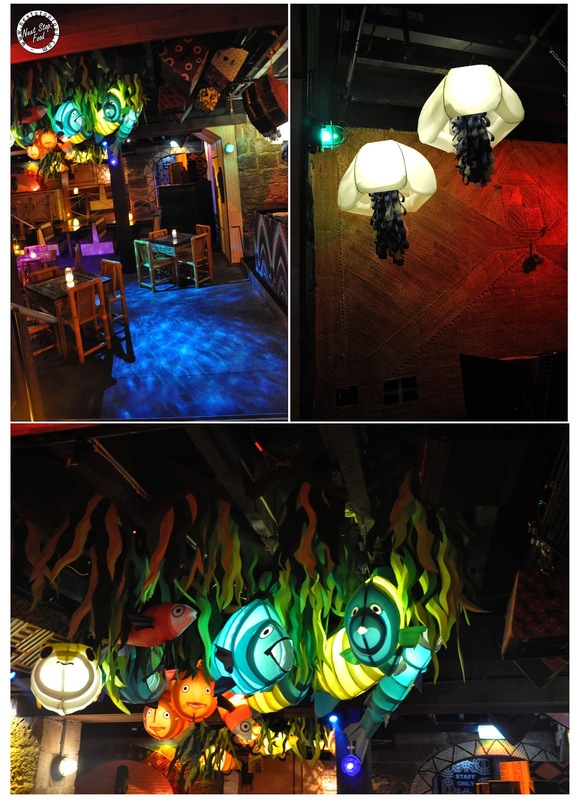 Besides enjoying the drinks and snacks, check out their decor too - Photo time! The Cliff Dive have a lot of seating while maintaining a spacious feeling. They also support local artists, like the fishes pictured above. The top bar is located near the entrance, check out the blue board with mugs hanging off it - that's another decor shipped from Bali. 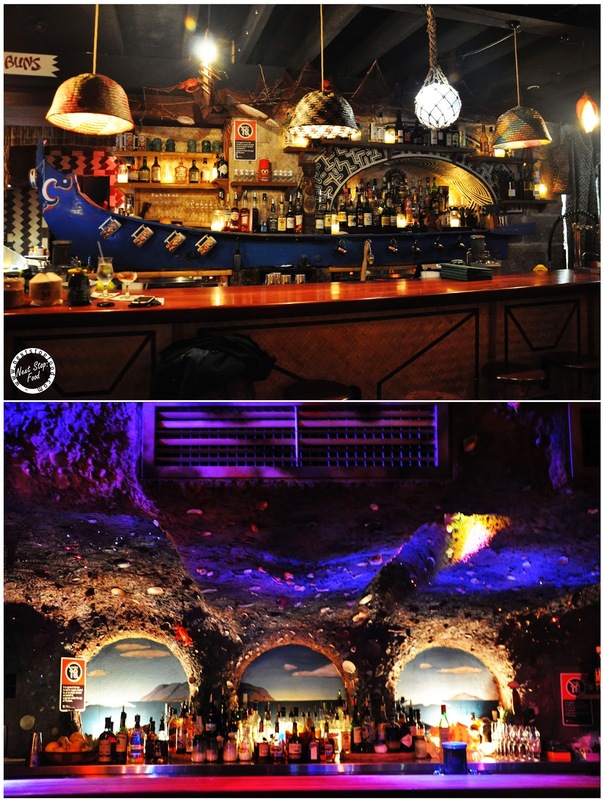 Tucked away in the side of the venue is another bar which is called the "The Cave". With seashells and purple/blue lights, it sure looks like just like a cave! Want to organize a party? 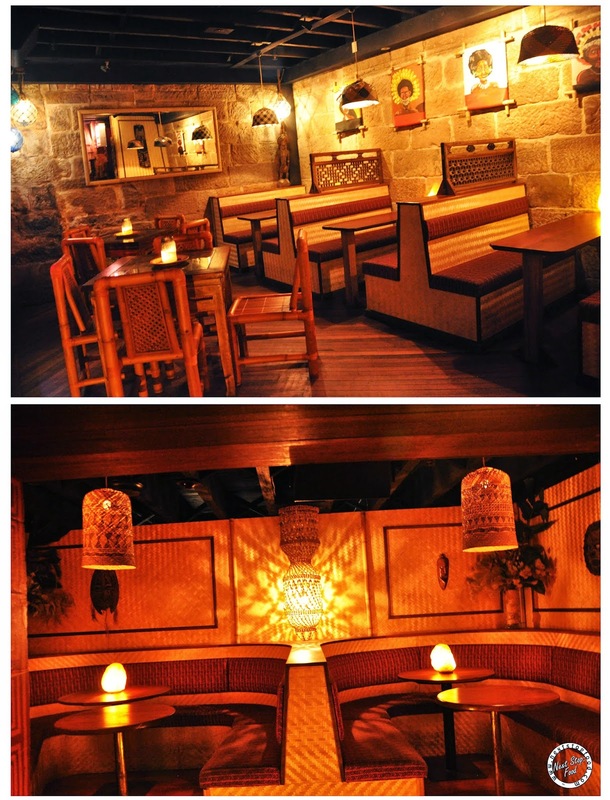 They take reservation for these booths and areas with no minimum cost! Contact Elise at elise@thecliffdive.com.au for more information. I had so much fun talking to all the passionate bartenders and chef, who are motivated to make delicious drinks and food. Yup! I'm coming back for a drink (or two) and skewers very soon! Lol loved the monkey hat - and not just for the vessel it came in! The beachbomber's zombie looks really cute.